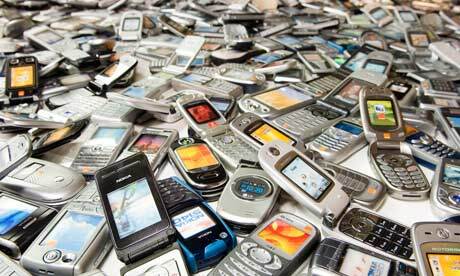 Just How Bad Is The Mobile Phone Waste Crisis? If there’s an irony to our ultra-efficient tech culture, it’s how little attention is given to disposing of all the e-waste it creates. Only about 13 percent of the 53 million tons of electronic waste created in 2009 was recycled, according to data from ABI Research. The Electronics Take Back Coalition, an organization that advocates for better e-waste policy, reports that pushier smartphone marketing has led to mobile phones being discarded at a faster pace. Because smartphones, unlike larger-sized electronic goods, can be mixed with general trash without standing out, they’re an overlooked risk to public health. Taking the following steps, however, could reduce further environmental damage. In 2004, California passed a Cell Phone Recycling Act. Put into effect in 2006, the law was based on the awareness that the average Californian bought a new mobile phone every 18 months, though most did not recycle the phones they replaced. The California Department of Toxic Substances Control tracks the success of their statewide recycling effort. A program that is relatively straightforward, it has been simple for cellphone users in the state to comply with. As a result, statistics show that mobile phone owners in Cali are more likely to recycle their phones than those in other parts of the United States. It’s easier said than done, but smartphones should be built with the environment in mind. While it may not be possible to entirely avoid using the chemicals, plastics and metals that smartphones are made of, the electronics companies who design them could make a greater effort to reduce the quantities of these toxic materials that are used. Some have proposed that electronics companies such as Apple and Samsung sell components that upgrade their phones. This would enable mobile phone owners to add the latest functionality and features without having to buy entirely new devices. Smartphone manufacturers and their distributors do a savvy job of marketing and selling. They need to offer the customers who purchase their devices, however, active support with the disposal of them. Offer information on what the recycling process involves at the point-of-sale. Make education a customer service effort. Give customers an option to receive recycling information via text or email. Provide incentives to those who recycle. Green is good. The first smartphone company that engages its customers in a discussion about responsibly replacing them will have nothing to lose and everything to gain.